While Diepenbrock was setting Vondel’s Rey van burchtsaeten (Choral Song of the Burghers, RC 28) for mixed choir a cappella to music in the autumn of 1892, progress was being made with the rebuilding of the new City Theatre on the Leidseplein in Amsterdam, on the place where the original building of 1774 had burnt down on 20 February 1890. At the same time the publisher De Erven F. Bohn in Haarlem was making preparations for a luxury edition of Vondel’s Gijsbrecht van Aemstel. It was to include an introductory study by the initiator Leo Simons (1862-1932), illustrations by Antoon Derkinderen (1859-1925), a series of designs for stage sets by H.P. Berlage (1856-1934) and the piano score of the incidental music (prologue, choral songs, interludes and postlude) by Bernard Zweers (1854-1924). Diepenbrock was kept up to date with how the project was getting on by his friend Derkinderen. During a visit on 4 June 1893, Derkinderen showed him not only drawings of his own designs, but also Zweers’ music. Looking through the simple musical setting, in which Zweers had converted the feet into one stereotype metre, caused a strong reaction in Diepenbrock and immediately he came up with all kinds of ideas for a setting of the choral songs of his own. This week I have noticed how much I need a trigger to work. I was not commissioned to write the Choral Songs, but only because I was ashamed of the music being so inferior to the poetry, I immediately […] set to work. Based on various data, it can be deduced that Diepenbrock must have started both compositions on 4 June. Within a month and a half he completed his Rey van clarissen (Choral Song of the Poor Clares) and his Rey van Amsterdamsche maegden (RC 31), on 7 and 18 July 1893 respectively, according to the date on the piano score A-12, which Diepenbrock made at the end of 1895 (neither of the original scores have been transmitted). When compiling the choral songs for the edition of the complete incidental music for the Gijsbrecht van Aemstel in 1912, Diepenbrock added a note to both that the composition dates from July 1893. In the autumn of 1893 Derkinderen, who thought it would be impossible to change the approach to the Gijsbrecht project, suggested to Tadema that Diepenbrock’s choral songs should be published separately – a plan the publisher discussed soon afterwards with the composer. However, Diepenbrock could only submit the material for assessment after it had been returned by Antoon Averkamp, who was to premiere the Rey van burchtsaeten on 30 May 1894. After this performance nothing more was said about the choral songs by Diepenbrock for over a year. Despite his fundamental criticism, Diepenbrock visited Zweers in March that year to ask whether he would teach him. Zweers agreed, on condition that he would not be paid for it. During their meetings, he showed many signs of regard, almost veneration, which regularly embarrassed Diepenbrock. Zweers himself took the initiative to recommend the publication of Diepenbrock’s choral songs to Tadema. Encouraged by this, on 3 September 1895 Diepenbrock started writing the music for the text that he had not yet set to music: the Rey van edelingen (Choral Song of the Noblemen) from the second act (see RC 33). Before discussing the Rey van clarissen any further, the history of all four choral songs needs to be examined. Diepenbrock completed the piano score of the Rey van edelingen on 30 September 1895, that of the Rey van Amsterdamsche maegden on 3 December and that of the Rey van clarissen on 11 December. Then the production of the edition could begin. After the composer had made several minor and major musical improvements in the proofs, the printed edition of the piano score of the Vier Reizangen uit Gijsbrecht van Aemstel (Four Choral Songs from Gijsbrecht van Aemstel) was published by De Erven F. Bohn in Haarlem on 13 May 1896. Shortly afterwards, on 1 June, Diepenbrock completed the orchestration of the Rey van clarissen. Three weeks later the revised score of the Rey van Amsterdamsche maegden, now with full orchestral accompaniment, was ready. After a trip to Italy with a close friend (the journey home took them through Bayreuth, where they attended a performance of Das Rheingold), Diepenbrock continued his work. Before the end of August the orchestration of the Rey van edelingen was finished. Both Smulders and Zweers criticised Diepenbrock’s orchestrations. During the Christmas holidays he had the opportunity to discuss them at length with Smulders in Liège. The comments prompted him to rewrite the scores of all three choral songs, which he completed on 16 April (Virgins), 24 May (Noblemen) and 10 June 1897 (Poor Clares). However, while he was revising the orchestration again, an unexpected opportunity arose: on the initiative of Tadema, the Haarlem department of the Maatschappij tot Bevordering der Toonkunst (Society for the Stimulation of Music) was considering a performance of the work in the season to come. So once more Diepenbrock had doubts about his orchestration, despite the optimism he had voiced at the end of March: Recently I have revised my score so thoroughly that I have no qualms about it. (BD III:31) Having become uncertain because he had missed so many details in the orchestra, on 29 July he sent the score to the very experienced composer-conductor Richard Hol (1825-1904 ) for assessment. However, we do not know his response. The Rey van clarissen comprises eight six-line strophes, which – like the Rey van Amsterdamsche maegden and the Rey van edelingen (RC 33) – are all tetrameters. While Zweers set the verses in a stereotype rhythm, Diepenbrock provided variation. For example, he starts the third and fourth line of the opening strophe thetically, in other words on the first beat. In the sixth line, “Hoe schel die in zijn ooren klinkt” (How piercing it sounds to his ears), two accents follow each other immediately against the metre of the verse. So the musical diction follows the meaning of the words. As we have seen above, Diepenbrock called the contents of this choral song epic-visionary. At the end of the third act of the Gijsbrecht van Aemstel (for a synopsis, see RC 28), the nuns allude to the pending danger that Christmas Eve is connected with: the murder of children in Bethlehem, which King Herod was to order after the birth of Christ. The misery caused by this evil deed is vividly depicted by the nuns. Thus, they point ahead to their own bloody end in the fourth act. The comfort they bring the wandering mothers of Bethlehem, at the same time means the acceptance of the horrific fate that awaits themselves. 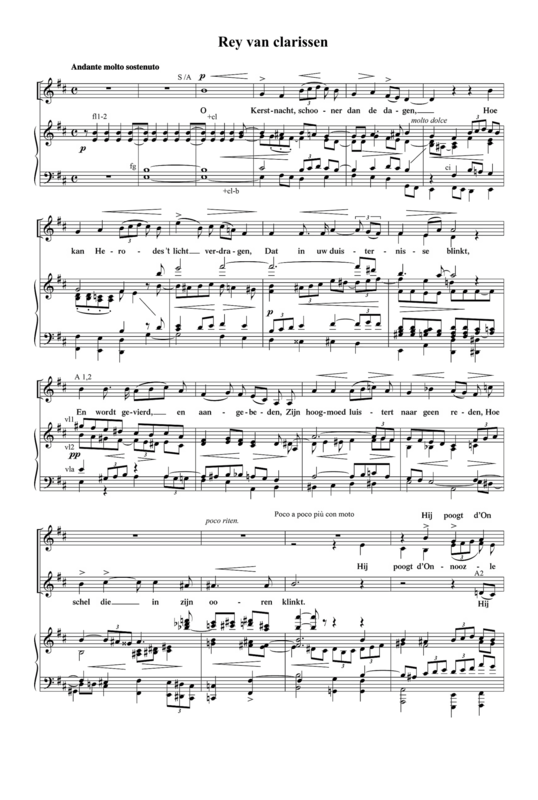 The melancholy theme in the Dorian mode with which Diepenbrock opens the first and second strophe, returns in the seventh strophe when a comparison is made to the scythe cutting ears of corn when mowing the wheat. Shortly after that there is word painting in the line “Wanneer het stormt in ’t wilde woud” (When it storms in the wild woods): as a bolt of lightning the clarinet flashes through the registers from high to low. This is one of the passages of which Diepenbrock refined the orchestration over the years. In both his score of 1896 (completed on 1 June) and that of 1897 (dated April – 10 June), in the measures preceding the clarinet part, there is a continuous triplet movement in the high register that diminishes the lightning effect on the moment supreme. The version of 1901 has the clarinet appearing out of mid-air. Other tendencies in successive orchestrations are the thinning out of the orchestral sound by a more moderate use of the so-called ‘loud brass’ and the increase of colour contrasts between the different groups of instruments, e.g. by omitting the strings (especially the high ones) more often or by creating more diversity in the use of registers. 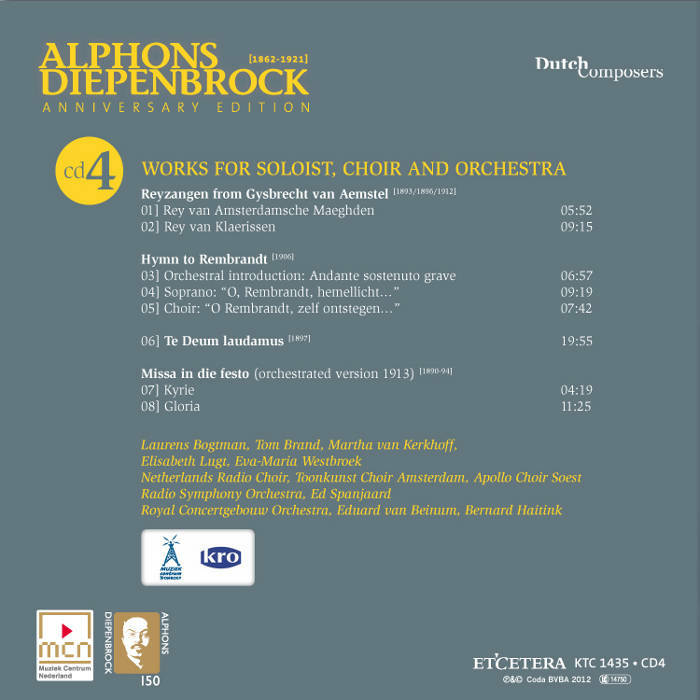 Diepenbrock never had the chance to enjoy the fruits of all the care and effort he put into the third orchestration of his Rey van clarissen, as after the disappointing premiere this work was never executed again by a good choir. It was not until June 1912 that this choral song was performed again, this time by a small ensemble, in the context of a complete production of Vondel’s Gijsbrecht van Aemstel at the Dutch Music Festival, for which the composer made an entirely new score (see RC 108). For this occasion he not only drastically cut back the orchestral parts, but he also made several changes to the vocal setting. O Kerstnacht, schooner dan de dagen! Hoe schel die in zijn ooren klinkt. En zooveel zwaarden rood geverfd? Gerukt noch vers van moeders borst. Eer ’t met een mist betrokken werd. En ’s morgens droncken d’eerste dauw? Zoo velt de zicht de korenaren. Wat luidt zoo schendigh dat haar rouwt! En door geen tiranny vergaat. Received with joy, by all adored? His arrogance leaves it no room. In Bethlehem, in crofts and homes. Now to the east and now to the west. And see all those swords dyed red? Snatched fresh from their mothers’ breast. She sees them soiled foul with blood. Before they are bedecked with mist. Drinking in the morning’s first dew? So the scythe fells the ears of corn. Whenever it storms in the wild woods. When it rushes about in ill faith! How great a rift, before it repents! And which no cruelty can conquer. 27 apr 1898: Uitvoering van drie Reyen uit Vondels Gysbrecht van Aemstel in de Concertzaal der Sociëteit Vereeniging te Haarlem door de afd. Haarlem van de Maatschappij tot bevordering der Toonkunst met medewerking van het Concertgebouw-Orkest onder leiding van Willem Robert. Voor de pauze worden uitsluitend werken van Brahms uitgevoerd. (Tragische Ouverture, Nänie en Tweede symfonie). Het tweede deel bevatte drie der door den Amsterdamschen toondichter Alphons Diepenbrock gecomponeerde Reyzangen uit Vondel's Gijsbrecht van Aemstel. Dit laatste werk – voor de keuze waarvan het bestuur van onze Toonkunst-afdeeling een woord van warme sympathie toekomt – was het groote punt van attractie voor allen die met mij den heer Alphons Diepenbrock uit de van hem bekende composities hebben leeren hoogschatten als een man van zeer bizonder talent. Ook deze Reyzangen geven van zijn kunst een heerlijk hoog denkbeeld. Diepenbrock is in den waren zin van het woord een toondichter. Het alledaagsche, het geestlooze is hem vreemd. Met heel zijn ziel, met den vollen rijkdom van middelen, hem door ongewone verbeeldingskracht, veelzijdige kennis, gelouterden kunstsmaak in de hand gegeven, streeft hij naar de verwezenlijking van het hem voorzwevende ideaal, zonder zich in zijn hooge vlucht te laten weerhouden door overwegingen van bloot practischen aard. Dit laatste reken ik den componist der Reyzangen natuurlijk niet als een deugd aan; want dat het ideale en het practische zeer goed kunnen samengaan blijkt b.v. uit de koorwerken en de orgelfuga's van den grootmeester Bach, waar de meest vrije vlucht van gedachte, de rijkste ontvouwing van polyphonie toch nimmer een betrekkelijk gemakkelijke uitvoering uitsluiten. Maar een juiste grenslijn is hier moeilijk te trekken en zoolang een componist niet het absoluut onmogelijke verlangt – en dit doet, voor zoover ik kon nagaan, de heer Diepenbrock nergens – heeft niemand het recht hem een ernstig verwijt te maken. Afgezien van de practische zijde kunnen wij van Diepenbrock's werk slechts met bewondering en eerbied spreken. Het merkteeken van het genie staat er onmiskenbaar op afgedrukt. — De uitvoering ervan hoorde ik op de generale repetitie geheel, op den concertavond gedeeltelijk. Het viel mij op dat dezen laatsten keer de gang van het geheel veel losser en elastischer was dan bij de repetitie en dat de vertolking ook in kleur en nuanceering gunstig bij den vorigen avond afstak. — Laten we hopen dat onze afdeeling van Toonkunst het niet bij deze eene uitvoering zal laten. Iedere nieuwe vertolking van het heerlijke werk zal de schoonheid ervan voor uitvoerders en toehoorders meer en meer ontsluieren – en ook zij voor wie tot heden Diepenbrocks kunst een gesloten boek was zullen weldra met sympathie en vereering opzien naar dezen kunstenaar van zoo uitnemende gaven. — Voor den heer Robert moet het groote voldoening zijn het werk te hebben mogen doen kennen en – voor zoover van hem afhing – ook liefhebben. Voor de belangrijke moeite die hij zich heeft willen getroosten komt hem een oprecht woord van dank en hulde toe.